The Swine That Dines is spin-off of The Greedy Pig, for those of you haven’t heard of the Greedy Pig they are a small establishment on North Street (near The Reliance) who serve breakfast, brunch and lunch. 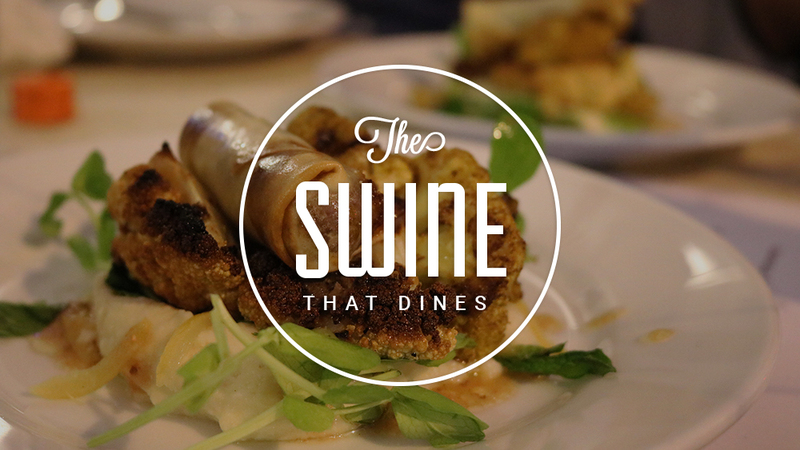 Their daytime offerings are some of the best around, you’re lucky if you can get a seat at the weekend but their real passion for food shines through in their not-so-new concept The Swine That Dines. The Swine That Dines sees the humble breakfast and sandwich shop turn in to dining room at night (Thursday,Friday and Saturday) with an infamous waiter (in the blogging world) and serving small plates of the highest standard. The Swine That Dines is famous in my Twitter-world but as soon as I step out of that world no one has heard of them, and that’s a shame because everyone should be shouting about them. It’s hard to believe that this was my first visit; it comes with a few shocked looks. A lot of bloggers jumped at the chance to visit as soon as they started opening on a Friday and Saturday night and with a mix of feeling like I was missing out I also didn’t want to produce another post that was exactly the same of every other food (and lifestyle) blogger out there. It’s been a while since The Swine That Dines opened now and the hum has settled a little, they’re also open Thursday’s too and it seems as if they’re going from strength to strength. I visited with fellow Blogger Becca (BigSpoonMyLittleSpoon) and her chap (P), plus D. We knew that we’d get along but would the guys…? Erm. Yes. Seems like they both like football, thus meaning a night full of football chatter for them whilst me and Becca talked about food and the like. Becca and P are TSTD connoisseurs and so we took their lead when they suggested that the best thing to do was order everything off the menu and share it between the two of us. Then one of the owners, Jo, threw a spanner in the works and pointed out they had specials. Two of the specials caught our eye so we substituted two of the main menu items out, ordering 7 dishes in total. 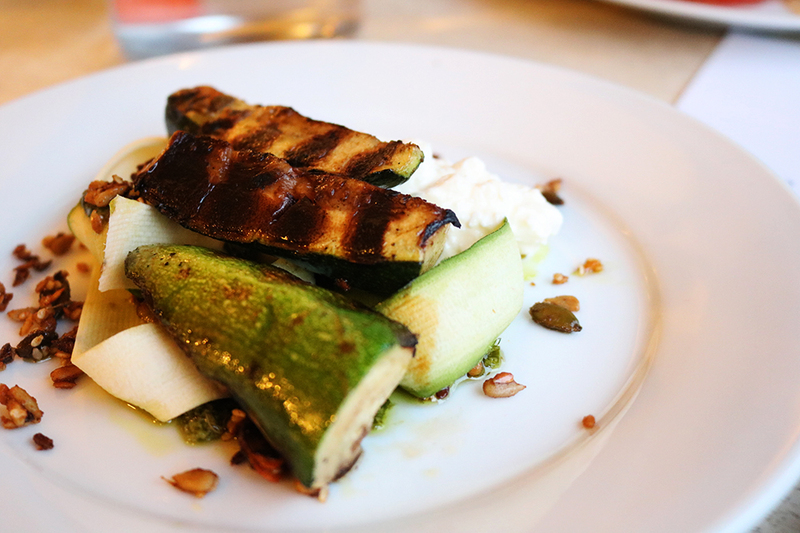 The first dish to reach our table was the courgette, seeds, cow’s curds and green sauce. Elegantly presented with thin slices and thicker chunks of courgette, that miraculously wasn’t soggy and even D exclaimed that he didn’t normally like courgette (despite my best efforts) but this courgette was delicious. When you’re receiving accolades like that from D you know you’ve started well. Whilst Becca and P indulged in the anchovy, tomato, fennel and habanero at our side of the table we were tucking in to the Asparagus, baby onions, avocado and basil. 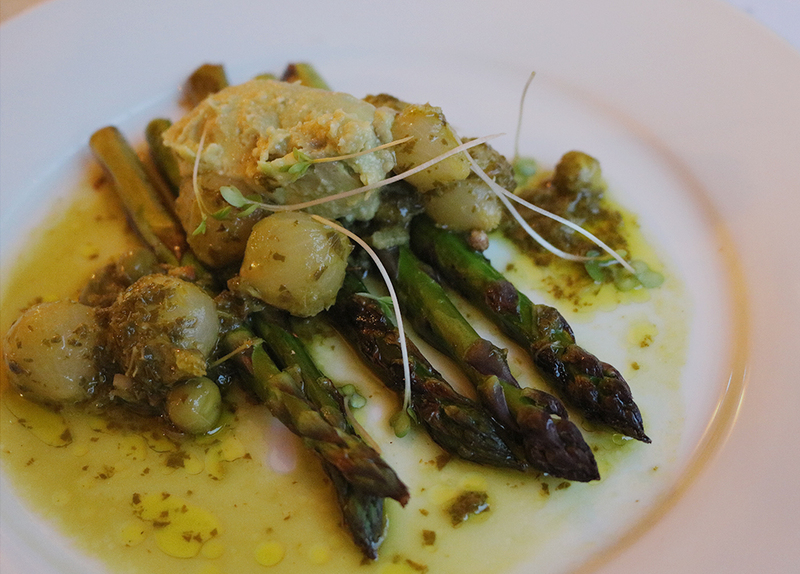 Another brilliant vegetable dish with all the flavours pairing beautifully. I claimed delight in pairing a mix of each ingredient with each bite. 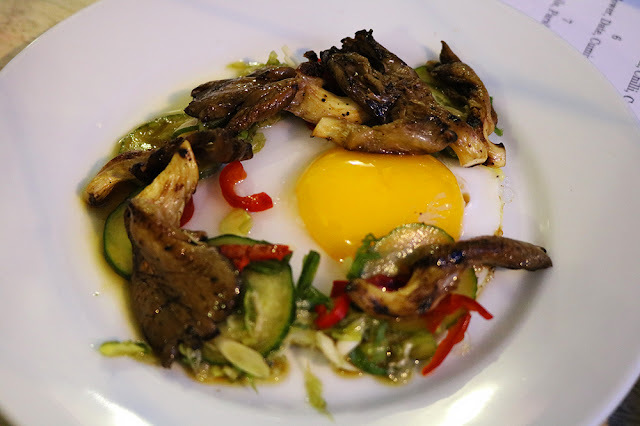 Our third dish of the night was to be duck egg, oyster mushrooms, chilli and cucumber. Reminding me of past Korean dishes (I guess it’s the mix of egg, chilli and cucumber), the duck egg was less rich than other duck eggs I’ve had before, not being an expert on eggs I’m not sure why this might have been and D didn’t know it wasn’t a normally egg until I reminded him of the menu. 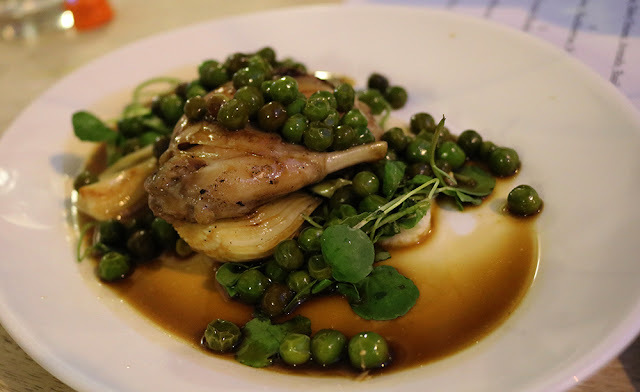 The next dish was the first of the specials, slow cooked rabbit leg with peas and gravy (jus?). Myself and D recently fell in love with rabbit at Kendell’s bistro, although the heart strings slightly pull as you eat it those cute little fellas are truly delicious and this dish was no different. The rabbit fell elegantly away from the bone aiding to the comforting spell of the whole dish. Dish number five was bang on trend with cauliflower, dates, cumin and lemon. 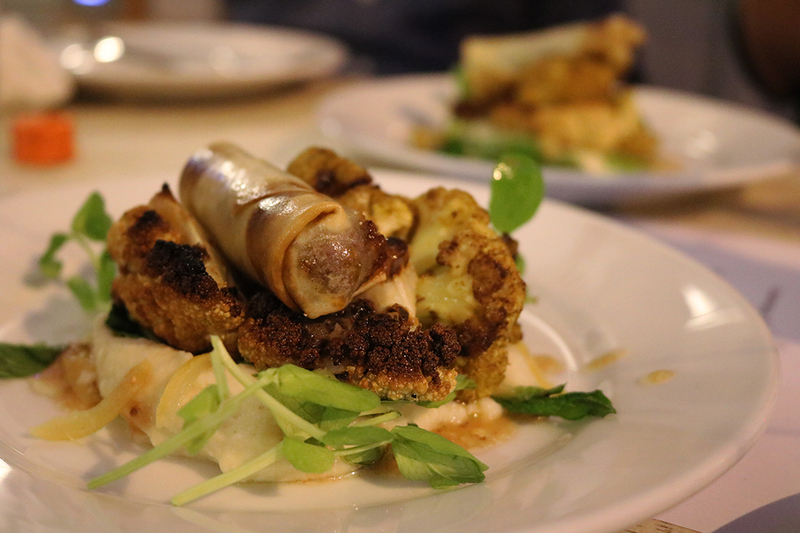 The cauliflower was roasted and sat on a bed of mash topped with a date spring roll. Individually the cauliflower and the spring roll were nice but together I wasn’t entirely sold. 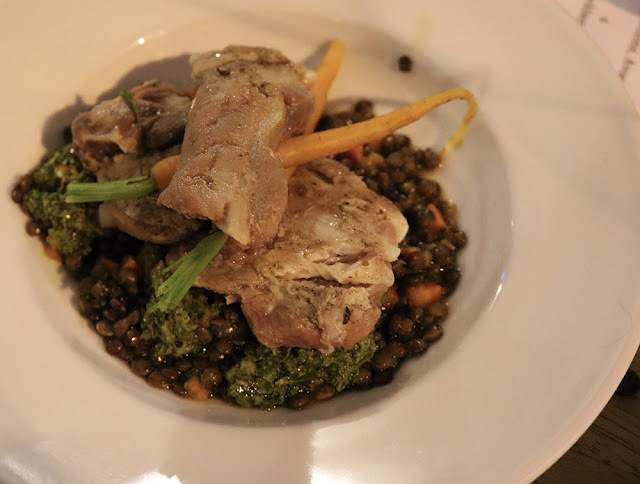 The final dish from the main menu was ribs, lentils, parsley and mustard. Call me naive but I’ve never had ribs that haven’t been slow cooked in some sort of barbecue sauce. These naked ribs were still appeared to be slow cooked, contained quite a few bones and were very meaty. This dish reminded me of something I had in Scotland a long time ago but I can’t quite put my finger on it. 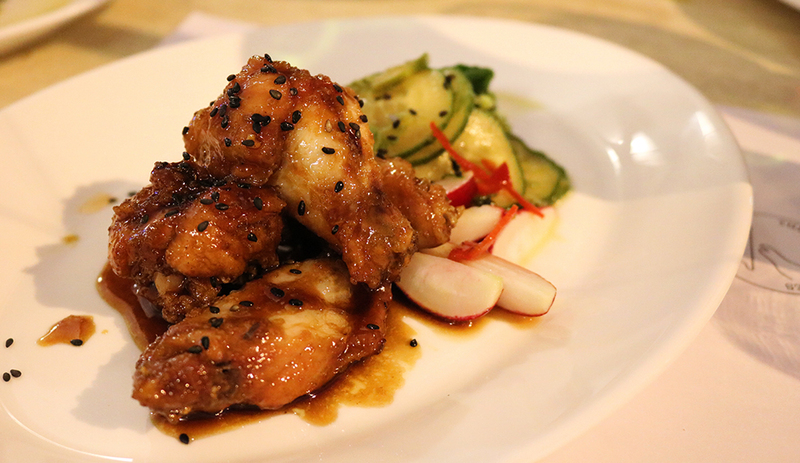 The final special dish was my favourite dish of the night, Korean chicken wings. Korean food is well and truly ‘in’ at the moment and I’m embracing it, the mix of sweet sauces, chilli and pickled vegetables are a winner for me, add some radishes to freshen it up and it’s a star dish. Feeling completely satisfied, slightly sloshed on our ‘bring-your-own’ wine I was intent on having dessert, relief was felt when the other three in the group felt the same. We spent a while debating on the pronunciation of ‘Clafoutis’ and after seeing it mentioned on Twitter earlier in the day it was pretty much cemented in my brain that we were to have this dessert. 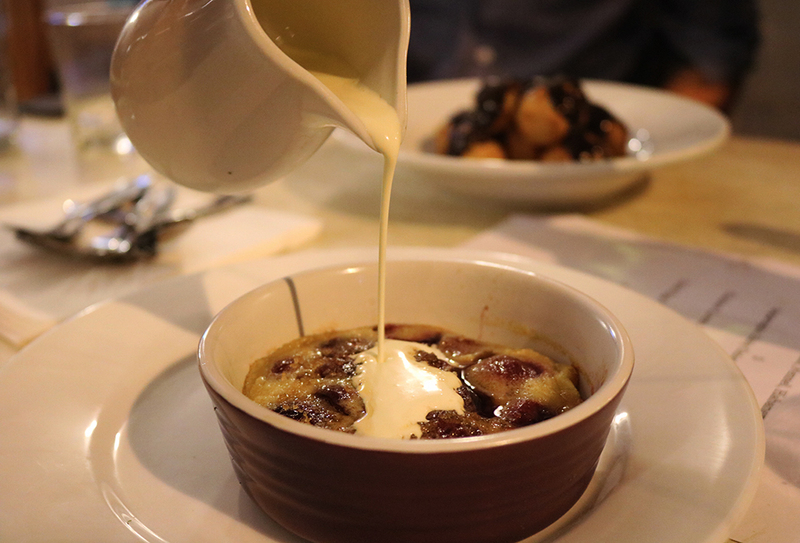 The cherry clafoutis was like a sweet Yorkshire pudding crossed with a bread and butter pudding. A somewhat heavy dessert to finish with D but I lapped it up all the same. 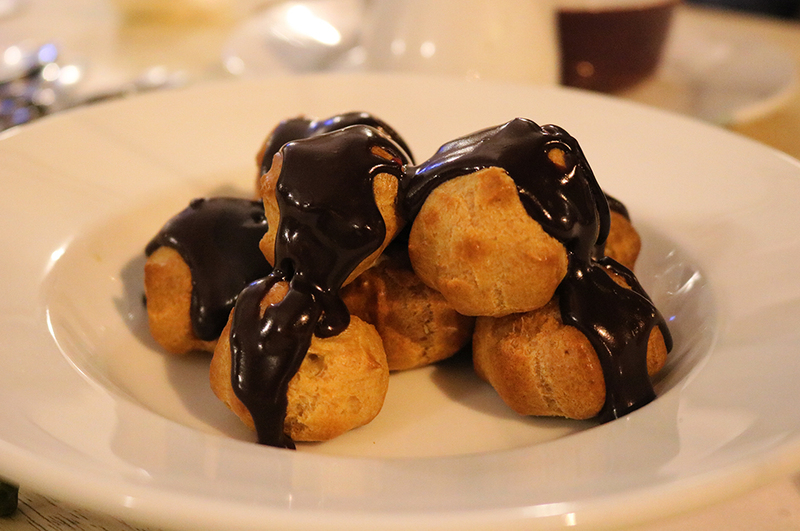 Across the table Becca and P indulged in banana profiteroles, lovely to look at but I’m not bananas biggest devotee so I swerved this option. Overall a great meal was had, the staff although rushed off their feet were gracious and smiley the whole time, despite us staying a little too long at the end of the night… sorry you just made us feel so damn welcome! If you haven’t been to The Greedy Pig or The Swine That Dines don’t expect lavish décor and silver service, this place is more down to Earth. Do expect amazing food and truly lovely lovely people. I couldn’t recommend The Swine That Dines highly enough.